Familiar little wildflower of the woodlands and grassy hedge-banks, this plant is quite similar to Early Dog-violet and is easily confused. 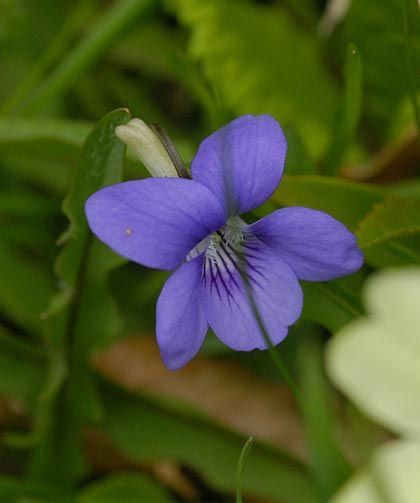 The unscented, blue-violet flower is always solitary on the stem, and is open with five petals, the lower of which has a stout, blunt, pale, curved spur which is notched at the tip. The mouth of the flower is absolutely wonderful to view through a hand-lens or magnifying glass. It has a pattern of deep purple lines which run into the throat over a paler violet patch, becoming white. The upper petals have a fringe which is over the opening. The dark-green, heart-shaped leaves are on long, slender stalks. This native plant which blooms from April until June is a larval foodplant of the Dark Green Fritillary. It belongs to the family Violaceae. I first identified this flower in Killiney, Co Dublin in 1977 and photographed it in the Burren in 1999. 'Look at us, said the violets blooming at her feet, all last winter we slept in the seeming death but at the right time God awakened us, and here we are to comfort you'.